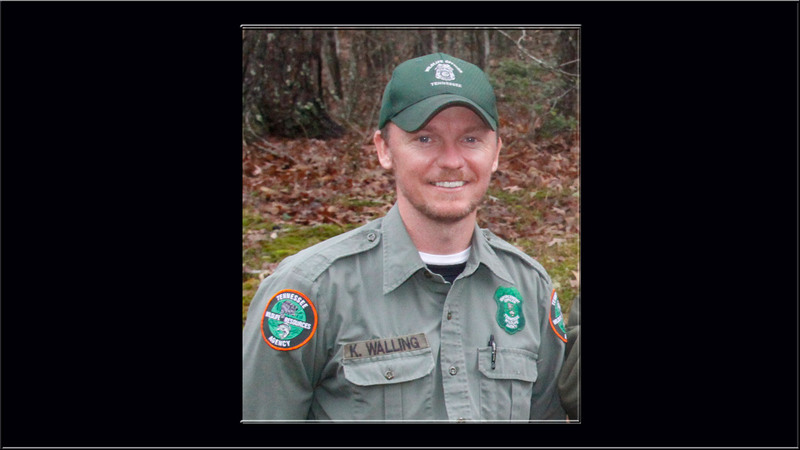 Kyle Walling has been named the Tennessee Wildlife Resources Agency Wildlife Officer of the Year for the Southeastern Association of Fish and Wildlife Agencies (SEAFWA). Walling is a wildlife officer in TWRA Region III’s District 31 and was selected among other TWRA law enforcement officers to become the state recipient. Walling is assigned to Van Buren County, but works throughout the district’s 12 counties. He will be recognized at the annual SEAFWA meeting in October, this year to be held in Mobile, Ala. and will be a candidate considered for the top officer in the entire Southeastern United States. Also honored as TWRA region and district selections were Brandon Gavrock, Region I and Chuck Casey, District 11; Rusty Thompson, Region II and Matt Brian, District 21; Joe Pike, District 32; Gene Parker, Region IV and Ryan Rosier, District 42. The officers were selected for their efforts in teamwork, public outreach, innovation, attitude, leadership, achievements and accomplishments. Walling conducted educational and outreach events that included boater education, hunter education, trapper education, NASP tournaments, fair booths, “Wildlife on Wheels” display at NWTF Jakes Day, and information booth at Tennessee Fur Harvester Association convention. He also participated in the Jim Hall Hunt for Wounded Warriors, and youth hunting and fishing events. “Kyle’s efforts in excellence and innovation were also great,” said Rider. “His dedication to the youth of the community and knowledge that he passes on is an achievement that will ensure the longevity of hunting, fishing, and trapping for many generations to come. His law enforcement efforts resulted in 2,018 hunters, fishermen and boaters being inspected for compliance. These duties produced a total of 121 court citations and warnings with 35 of these being big game cases. He also assisted other officers with additional citations and warnings. Walling is a TWRA Honor Guard member, helping demonstrate his passion in honoring agency law enforcement personnel for their career service as wildlife officers. “Kyle is not only a great asset for the agency, but also for the hunters, anglers and boaters in the state of Tennessee,” said Rider.